New Online Workshop! The Creative Planner! Planner Society Monthly Kit Sign Up! New mini class up for March! Happy March & Free Watercolor Girl Printable! New Mini Class up! February Art Society! Sharing the Love.. happy February! New She Matters 2015 Summer Retreat! New 2015 Workshops and Retreats! Its finally here!! My newest online workshop!! I am SO excited to finally announce my newest online workshop! (more details to come on the other workshops staring this fall as well).. but FIRST.. i know I have been teasing you with sneak peeks of this workshop on my facebook page!! and so here it is!! just in time for Back to School, back to work, new found artsy fun.. I present to you..
Who doesn't love to express themselves through creative wearable art? I know I DO and one way I do that is by making and wearing my own stack-able bracelets!! I have seen this trend continue to grow over the last year and i love how expressive and personal it can be to show your unique personality! I am also excited for this workshop because I am team teaching it along with my very creative.. very fun daughter, Allie! She is just turning 13.. and she is adding that bit of "young and fun" to this workshop! This workshop is perfect for everyone of all creative ages! So want to know the details? that's right!!! you will learn how to make over 25 different styles of bracelets in this workshop!! We will be working with leather, metal stamping, painted fabric, cording, beads, macrame, braided chains, wood and so much more! Each one just as unique and fun as then next, perfect for wearing with each other to create a customized stackable look each day. So fun for girls (and boys) of any age to learn and great ideas for gifts or even BACK To school!! This workshop is available in full step by step videos in a very organized classroom (if you have taken any of my workshops before you know how wonderful and organized each classroom is). Videos may also include PDF's and handouts as needed for the particular bracelet. Plus full supply lists for each video. This workshop starts August 21st and all videos will be available day 1!! So you have instant access to all of the bracelets right away! Kits will be available for purchase on August 6th and will ship out the week of August 15th! I will send out an email first to those of you already signed up for purchase and you will receive the private link before they are open to the public for purchase. AND this class is available for an entire year! For you to go back and watch over and over again! 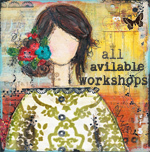 Allie and I would love to have you join us in this artsy creative wearable art class! hope you join us! Class starts August 21st! Happy I am heading out tomorrow on a camping trip with my daughter, Allie and 21 other crazy women and teenage girls! Girls Camp! wahoo! We will be learning team building experiences, hiking, learning life skills AND of course arts and crafts (I am taking and teaching them this class actually!) it's going to be a ton of fun! So I won't be back until Friday.. but when I get back I have a special blog post for you! Junelle Jacobson has been busy making a very messy artsy project using our June and july mixed media kits! She has done a video for each and I will be posting those next week! Wahoo! Happy Monday! first off.. to all you wonderful people.. thank you for the kind words of support and encouragement you left on tuesdays blog post! and the private emails that came in as well. I am VERy blessed to call you all friends. THANK YOU.. truly from my heart. probably got it and were like.. what the HECK are we going to create with this? Lol..
well i recently as of late.. have become a HUGe fan of Pinterest.. and could spend hours (okay do spend hours) on there just getting ideas upon ideas that I want to do with my kids, for myself, for my art studio.. new fun things to try.. you name it. Speaking of which.. I am writing about all of that in another blog post for next week. BUT one thing I saw.. was this awesome post from A beautiful Mess's.. taking wood or canvas using letter stickers as masks for creating a word saying canvas. I ALSO was reading on my dear friends blog the other day.. Alisa Burke and came across THIS post about using scribble dimensional paint and then painting over it and making it look as though it has this beautiful embossed old world look to it. Here is a picture of what she did..
She is ONE creative soul that girl.. So I thought how fun it would be to take BOTH ideas and create a monthly kit for it and do both of those techniques.. mixed with a little artsy messy stuff and doodling.. and this is what I came up with.. It's a little different than what we usually make.. but seriously fun and I did learn a few tips on the way.. so make sure to watch the video!! I almost want to make another one and this time do alot more with the puffy paint.. More like what Alisa did.. oh so cute.. so you might see another one later with even more! there are so many letter stickers left over and border stickers.. you make lots and lots of these for yourself or friends and family! SUper fun! Anyhow.. have a WONDERFUL weekend.. and see you back here monday when I officially announce and start sign ups for my next three classes!!! wahoo! can't wait! see you then! okay.. so you know me... once in a while I get pretty serious and have to speak my mind and today is one of these days..
LOVE getting emails from people who say that art has changed their life. That through watching videos or taking workshops (and not just mine).. but in general.. about mixed media art.. they have found their "Wings" so to speak.. and feel confident and happy and they find themselves with more to look forward to each day. One of the things of course I guess I am famous for.. is NOT following the rules when it comes to art and well I guess life and general. I have always believed rules are meant to be broken (when they don't hurt other people of course).. but you know what i mean. I have a friend who always makes fun of me for making up new words or misspelling or MIS USING a word.. and I say.. hey..who decided that word needs to be used that way anyway? just because the VAST majority of people in the world use that word "This" way.. can't I make up my own word? and use it the way i want? and the response is always.. Yes I guess you can. Its like my son who showed up to church one sunday wearing one green flip flop and one blue. You would expect any mother to be mortified for one.. that he was wearing flip flops in the first place.. but the fact they were two different colors.. probably even more. My other kids (this was my son Ethan by the way.. I believe around 6 at the time).. my other kids were like.. MOM! That is so embarrassing! They don't even match! To which my response was.. SO? who says they have to match? WHen did someone make up the rule that both shoes had to match.. or that our shirts match our pants.. or whatever the case may be. Sure it might be more pleasing to the EYE if both shoes matched but i have always taught my kids to be individuals and there is no wrong or right when it comes to that (again as long as it is morally correct and doesn't hurt someone else or themselves). So I just put my arm around him (he had his head hung low.. because now he seemed embarrassed).. and I said.. Ethan! I LOVE your choice of shoes today! So unique and SO creative! might have to try it myself sometime"
and you should have seen the smile on his face as I reassured him it was okay to be different. Now granted he PROBABLY wore different colors because he couldn't find the matches.. but still okay in my book. Anyhow.. im just a girl who likes to color outside the lines. SO recently as many of you know, I was on the show Craft Wars.. and I have already wrote about my experience in THIS blog post.. and since that episode has aired I have received SO many emails from many of you saying how you just loved that big old yellow bus and how disappointed you were that I didn't win. So let me start by saying this.. I am TRULY not disappointed I didn't win. I went onto the show KNOWING that I only had a one in three chance of wining.. so I didn't go on thinking I would.. but I went on because I LOVED the idea behind it and wanted to see if I could stand up to the challenges presented. So don't be sorry for me that I didn't win. TRULY i am okay with it.. had a GREAT experience and would do it again in a heartbeat! However I have to admit.. and I haven't gone back to read my last post about this.. but I am pretty sure I didn't tell you this.. but I was actually EMBARRASSED almost for the episode to air because honestly as we were applying the mod podge over the front and sides and back of the bus with all sorts of mismatched fabrics.. I kept looking at this and thinking.. wow.. this really looks like crap! lol.. Mostly because some of the products being used weren't great for mod podge (Like felt.. just goes a gross color specially yellow when it gets wet).. and also because it was applied so this way and that. Which of course my helpers did.. BUT I won't let that be their fault either because I should have been better at directing them on how to put it on.. (wanted more of a quilt like pattern with straight edges). But it's okay. I think no matter what It just didn't turn out as intended. I also had great intention of doing wood scallops in blue, with red and black and yellow doodled scallops and strips within the modeling around the top of the bus and around windows and doors and stuff and again.. didn't turn out as expected and used foam instead because I kept being reminded that this was craft wars.. not design wars and crafting is all about using fun mediums in my opinion. okay.. so on saturday this last week I was driving on my way to utah and my daughter was checking my emails for me and read me this email that I received from a dear sweet women who has taken my classes and and loves mixed media art. It was a very long email and mostly about the show and her opinion on it and her take on the bus.. she said somethings in her email that actually brought tears to my eyes. She reminded me how SILLY i was being for being embarrassed about the look of the outside of the bus. About it not being perfectly as I had intended it.. and how silly I was for not embracing how the bus took on a life of it's own. I teach all day long in my videos in in classes.. that art is NOT perfect.. nor should it be.. That there are NO mistakes in art. That whatever happens through the process is beautiful texture and layer that just adds character to it. An accidental spilled paint. Or a color that you didn't just quite like.. and I don't just teach it. I BELIEVE it! Her email really made me think.. she is right. I should be embracing this wonderful BIG YELLOW bus of messy modpodge mixed fabrics and all. So I wanted to share with you a few of the things she said to me.. if that is okay (and I already asked and she said It was okay with her as well)..I won't share all of it.. but here is just a few things that actually brought tears to my eyes..and was a gentle reminder of why i do what I do.. and why we should ALL love what we create. utterly delighted when I recognized that you were one of the contestants! and decorated prompted me to immediately want to go and make some art. world needs you (and I say all of us)... creating beauty in it. WOW was all I could say.. and I do have to say.. this is NOT about wining or loosing..In my very HUMBLE opinion I loved cherly's playhouse. The red Schoolhouse. It was HER art and her perspective and her beautiful imprint on this world of creativity. So I am okay with not wining.. but what her email made me realize is that I was NOT okay with thinking mine look like crap because it didn't turn out the way I had intended. She is right! there are NO mistakes in artist creation whether it be on a small canvas or a big Mosaic garden in the middle of an inner city slum! Art doesn't HAVE to be matchy matchy or perfect. It can be.. in my opinion.. but doesn't have to be. ANd not all of us will like everyone's art.. and the best part is.. that we don't have to! Maybe what is visually appealing to us isn't visually appealing to another person.. but we should never call it ugly or wrong because it isn't what we thought it should be. we should respect it and encourage our difference and embrace that art is so unique! I love that through art we are teaching our children to be unique and to be themselves and create a mark in the world that is unique only to them. To be okay with being different and quirky and respecting OTHERS in the same light and way. To recognize that we are all artist whether it be with paint, or food, frosting, or a camera or beads and pliers or a saw.. we all have some bit of creativity in our souls that our Heavenly Father put there long ago.. and I love that teaching ourselves and reminding ourselves of that and to embrace it.. is what makes doing what I do worth it. I don't actually even remember what the judges had to say to me about my bus.. I wasn't bothered by it and actually I respected their opinions of either not liking or it liking it.. BUT since then I have watched the other episodes and I have been bothered by one thing.. the continuous put downs of the contestants for using a product the wrong way or not creating something the way THEY thought it should be. I know the show was designed to be like Cupcake wars and also chopped.. but ARt is SO different than food. There isn't one kind of baking soda that makes a cake rise and be fluffy in art. Meaning.. there isn't only one glue that can get the intended job done. That is the great thing about art. Is taking a product or a paint or anything and using it in new, different and creative ways! Who says white glue is the ONLY thing you should use to apply glitter (hated that comment in the glitter episode).. or that you can't use a glue gun to apply something.. or that you should ONLY use fabric glue on fabric.. sorry folks.. I just don't believe that is the case. I wish instead that the show and the judges would focus more on the creativity of the project created.. to embrace the uniqueness of someones birdhouse made or dog palace. To be estatic that someone found a new way to use felt or apply glitter or whatever. I also wished the show let the true creative nature of the crafters show through. I wish they weren't so negative and saying "well this wasn't right and you didn't do this right".. sorry but that isn't what art is all about.. or crafting.. not for me anyway. I wanted to reach through the screen and hug those contestants and say "heck I LOVED what you did! It rocked and I love how you used that product" .. it creativity as its finest. So thank you shawn for reminding me that art isn't perfect and by me continually saying to friends and family.. I hated that bus and thought it looked horrible and wasn't perfect.. is me totally being a hypocrite when it comes to what I teach. It was art and its what I created in the time I had and what the products and challenges I was given. I would hope kids would run into the playhouse and see the imperfection in there and think.. heck if she can be imperfect in the way she creates.. then Maybe I can do and heck.. yes I am an artist too! I recently got an email from a 12 year old girl in Pakistan.. and it also brought tears to my eyes.. in it she talked about how she has never felt so inspired in her life to do or be something.. then learning how to create mixed media art. She says she never has anything made her lay awake at night glued to her Ipad being inspired by art and dreaming of what she can create and what she wants to do. She said she has found something that truly has inspired her to live life differently. She said that the only thing they have in Pakistan is paint.. no other art supplies because they can't bring in good from other countries.. not allowed by the government.. but that she still loves to create and loves that I teach people to get out of their shells and just create. There is no wrong.. just create! She finished by say this.. and I have to put this in here because this was another email that seriously brought tears to my eyes.. just imagining this 12 year old girl laying on her bed .. across the world in Pakistan.. dreaming of this..
mind I'm only twelve and have my whole life ahead of me... I'm going to start art journaling again. until her mother comes and scolds her so I really have to go or else I'd get scolded,or I could spend whole night writing bout you. Um holy cow.. that just gives me chills.. "H" I ADORE YOU!!! I hope you don't want until you are my age to teach and inspire others.. start NOW.. she has four brothers and sisters.. start teaching them! Spread the art love and creative fire that you have.. it feeds the soul and seriously gives wings to the heart. So thank you for everyone who sends me emails and inspires ME to keep doing what I do.. to those of you that REMIND ME to keep coloring outside of the lines.. that art is not perfect and there are NO mistakes in art. That we are all creative souls and no matter our likes or differences in art.. we all have one thing in common.. we are all artists and should respect each other as such. okay folks.. you know its summer time when it's over a week between posts! lol..
last week we headed to the mountains of Northern Utah and camped and boated for 4 days with some great friends of ours! It was the first time we have been to bear lake and oh my heck the water there is BEAUTIFUL! It reminded me of the water in the Grand Caymans.. so blue and beautiful ..loved walking the beach..
and I surfed the best yet! AND guess what else? Ben and I surfed together! he surfs goofy.. and I am lefty.. so he surfed on one side of the wake and I surfed on the other at the same time! Have to post that video for you! So cool! AND also let you know that this week is the FINAL week that my online workshop.. Your Living Canvas Workshop, will be available this summer! It won't be available again until Mid October..and when it does it will be an entirely NEW classroom with new students and new facebook group page. SO if you have friends that have been taking the workshop and you want to join them.. this week is the last week to join! Because the next time the workshop opens it will be in its very own classroom! Art and I decided to do it this way when we re-open it because we want to create a personal experience again.. with our second group.. so again.. if you have friends who joined in the first workshop that officially debuted in May.. and you want to join them.. OR if you have been thinking about doing this as a summer project.. THIS IS THE LAST WEEK! And remember when you join, you will have a full year to access the classroom! So come join us.. the first alumni group! and speaking of them.. I wanted to share a little of what they have been creating!! In this 6 week course, Art and I teach you how to create your living canvas thought journaling and life changing exercises.. AND art techniques as well! here is a sneak peek of just a FEW Of the things you will create during this class! Several canvas projects and lots of art journaling pages! Each week has its own new set of projects and journaling exercises from Art! you can read more about this workshop and sign up HERE! well I hope you all have a very happy week.. summer is so crazy for me.. mainly because I just have made the commitment to spend most of my time with my family.. they have these 2 months off school and its important for me to enjoy them! NEXT week I will be posting about three new upcoming workshops I have planned for early fall! One actually starts in mid August (a mini bracelet Jewerly class!).. another class starts in mid September and is a holiday ART class.. which is a 3 week course where I teach you how to create holiday scenes for halloween, fall and christmas (think snowmen, santa's, angels.. pumpkins, whimsical cats and more!) .. gonna be SO fun! AND the third class will be another class by Junelle Jacobson! Art of Wild Abandonment Two!! It starts in Mid October! SO plenty of fun things lined up for fall.. to keep your creative juices flowing!! So um yea.. so MIA this week! lol.. but sometimes you just got to step away from the computer and be present. RIGHT? this week had many intentions of doing some great blog posts.. but ended up spending the week with family! Bens sisters came into town earlier this week and we had a blast camping at the new/old house.. set up tents all over the yard .. let off fireworks.. and ate tin foil dinners cooked over the fire pit. During the days we took advantage of the fact we hardly had ANY wind this week.. and spend the entire days on the boat..
. At nights we roasted marshmallows, starburst, and my new found favorite.. cinnamon bears.. YUM..
(i posted this on facebook and had a couple of questions from it.. first off.. i got the silver bracelet from THIS etsy store.. it's the longitude and latitude of where ben and I were married. The other bracelets I made.. and people for months have been emailing and asking me to do a class on them.. so coming in AUGUST.. allie and I will be doing a mini online workshop showing you how to make 6 of our FAVORITE bracelets.. to create a fun bracelet ensemble..).. gonna be fun! we also spent the morning painting our fingernails and toe nails to show our patriotic pride! Went down to the river and saw all the festivities for the 4th.. and just have had a blast! Ate corn on the cob, pronto pups and cotton candy! (which was bigger than allie).. This week has been just full of wonderful memories and being with family. Bens family has now gone and today MY family is coming! and.. guess what.. back to the boat we go (it helps the lake is 1/4 mile from the new/old house).. and dinner again tonight round the fire pit! Can't wait.. haven't seen my sister Leah in over a year! Miss the heck out of her and her sweet family!! Hope you are all enjoying this week as well.. spending it with those who matter most. Being present and just making happy memories! The Boot Series Watercolor Workshop!